Efficiency is the key to any system’s success, and delivering power is no exception. AMSC’s Superconductor Cable Systems utilize Amperium® high temperature superconductor (HTS) wire, which can transmit up to 10 times more power than traditional aluminum or copper conductors, or can carry equivalent power at much lower voltages. Ideal for both direct current (DC) and alternating current (AC) systems, superconductor cables may be used in utility power networks or in commercial and industrial applications such as data centers. AMSC’s REG applications feature cable systems that utilize AMSC’s Amperium® high temperature superconductor (HTS) wire in place of traditional aluminum or copper conductors. Cables that utilize HTS wire have no resistance to the flow of electricity and can transmit up to 10 times more power than conventional cables, allowing bulk transfer of transmission levels of power at distribution voltages. Furthermore, REG cables are inherently fault current limiting which is not possible in traditional cables. By combining bulk power transfer and fault current limiting at distribution voltages, REG Systems give utility engineers a new tool that provides reliability and load serving improvements that was previously not technically or financially feasible with traditional technologies. REG cables are remarkably compact and easy to site compared traditional technologies with similar power transfer capabilities, which makes it much easier and less costly to provide step-change improvements in reliability within dense urban areas where infrastructure improvements are generally expensive and difficult. 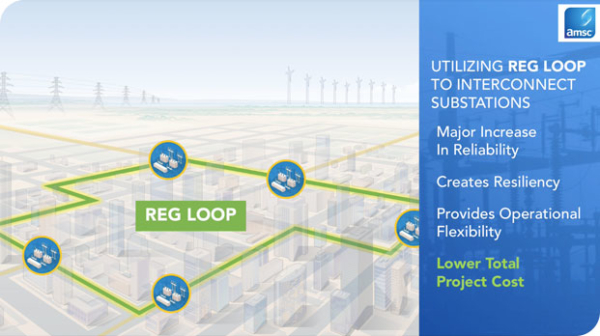 Utilities are under increasing pressure to improve their ability to serve loads in urban environments. At the same time, costs for acquiring land and performing construction projects in those urban environments is skyrocketing. Additionally, there is a growing demand that utility infrastructure be placed underground for aesthetic and security reasons. AMSC’s Branch application of its REG system can provide substantial relief to utilities that are faced with these challenges. REG systems allow utilities to move bulk power into and around urban areas underground at distribution voltages in an extraordinarily compact manner. Siting, permitting, and installing transformers and transmission voltage equipment is expensive and difficult within urban areas. 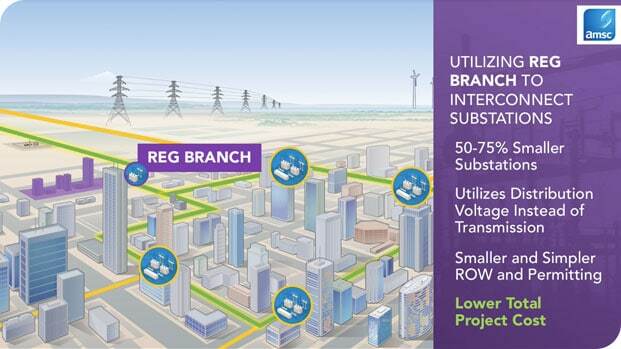 REG Branch enables utilities to reduce the need for transmission voltage equipment or allow them to locate this equipment outside of the urban areas, substantially reducing project duration, disruption, and cost by reducing the size of the new substation by up to 75%. Catastrophic equipment failures, physical and cyber threats, weather-related disasters, as well as failure of aging equipment can all leave entire sections of a city without power for hours or days. The inability to restore power in a timely manner only makes the situation worse. AMSC’s Loop application of its REG system provides protection against blackouts that can follow the loss of critical substation facilities by allowing the interconnection of nearby substations, enabling them to share transmission connections and excess station capacity, while controlling the high fault currents that naturally result from such interconnections. HVDC: To meet increasing power demands, the electricity infrastructure is changing. From North America to Europe to Asia, grand power networks are being planned. Wind and solar power must be carried vast distances. Power must be shared between disparate regions. 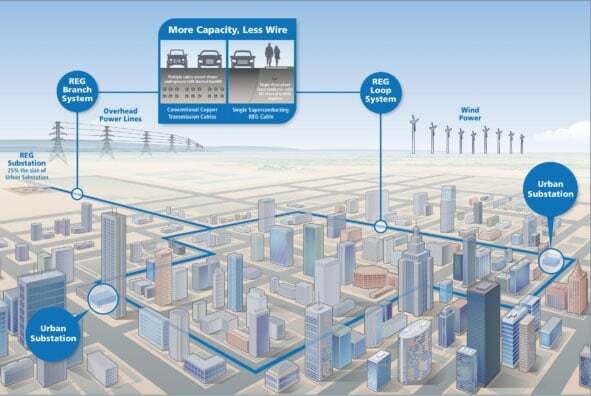 And central to many of these projects are HVDC cable systems. As the transmission medium for HVDC applications, superconductor cables can move virtually any amount of power with much greater efficiency than any other transmission technology – and they move it underground, out of site and out of harm’s way. Additionally, with HVDC superconductor cables, you can install a single superconductor cable allowing for future grid expansion without requiring the construction of new lines. Whether utility or commercial, alternating current (AC) or direct current (DC), we have the experience and the solutions to help system operators meet rising power demands.